Historically, teachers use word problems or context rich problems to develop and assess students' ability to use science and math techniques. For example, students are given a problem that tells them the velocity at which a car drives down a road, and the length of time it drives, and are asked to find the distance the car will move. These problems are effective ways of teaching and learning, as evidenced by the fact that generations of scientists honed their skills using word problems in their textbooks. Presented here is an alternative that has become possible now that we can use digital media to deliver and assess teaching. Instead of a verbal description or drawing, along with explicitly stated numerical information, students can be given a video clip that contains data to solve a question. 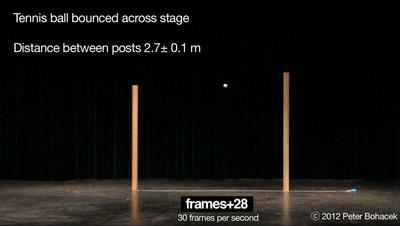 For example, this video clip shows a video of a tennis ball bouncing across a stage. Students are asked to view the video clip, extract data they need from the clip and determine the angle at which the ball lands on the ground during the second bounce. On first view, it may seem surprising that students can use the information in the video shown here to determine the angle at which the ball hits the ground. The only numerical information given is the horizontal distance between two vertical poles. In order for students to solve this problem they have to go one step deeper in their thinking than they would in a problem where the numerical information is given explicitly. First, they must determine which data they need and how to use the video to get it. Only once they have extracted the data they need can they begin the process they'd use to solve a traditional word problem. For this particular example, students need to recognize that the velocity of the ball has two components, vertical and horizontal, and that they can determine these by two different means. In both cases, they need to measure a time interval, which they can do by counting the frames in the video and dividing by the frame rate. 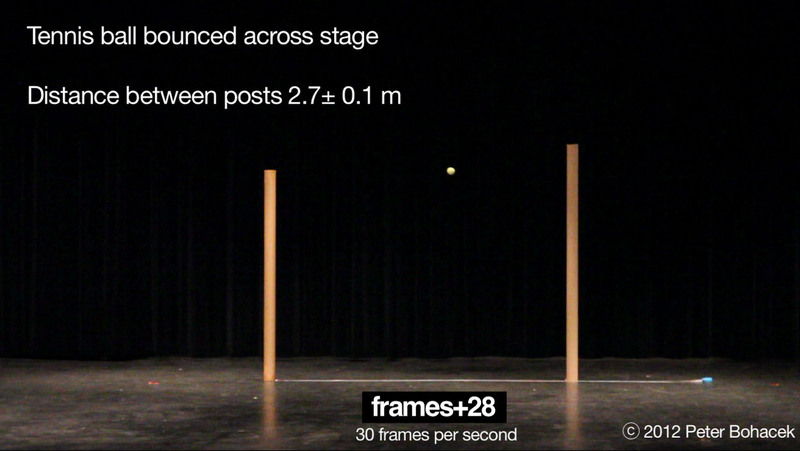 For the horizontal velocity, students can count the number of frames it takes for the ball to pass between the two vertical posts. Since they know the distance between the posts, they can use the time to determine the horizontal velocity. Similarly, students can count the frames to find the time during which the ball is airborne between bounces and use the equations of motion for an object moving in free fall to determine the vertical velocity of the ball when it lands. Finally, students use vector addition to combine the two components of the velocity to find the angle at which the ball is moving when it lands. This approach can be adapted to a wide range of mechanics topics. The two videos below demonstrate some of the types of situations that lend themselves to this method of instruction. Direct Measurement videos show situations that students can use to learn and apply physics concepts. Grids, rulers, and frame-counters are added as overlays on the video. These allow students to make precise measurements of quantities such as position and time. Students use these quantities along with physics concepts to solve problems and answer questions about the motion of the objects in the video. These problems can be used as a replacement of or supplement to traditional word problems. They can also be used as open-ended questions for students to explore to help them develop problem solving skills. The video show at right shows some examples of Direct Measurement videos. Our videos are grouped in sets of abstract and applied videos. Abstract videos show simplified situations, usually recorded in the classroom or lab, that highlight specific physics concepts. These abstract videos are often grouped with applied videos, which show the same physics concept, but in a real-world application. The video at right shows a description of the difference between abstract and applied direct measurement videos. Here are some additional examples of Direct Measurement physics videos.